When AMRAD’s pioneering station 1XE at Medford Hillside went on the air, Eunice became the ﬁrst woman announcer in Massachusetts. Before commercial radio was ofﬁcially born, Eunice Randall went to work at AMRAD, a company that made receivers for amateur radio fans. A talented “drafts lady,” she made technical drawings and as she learned more about radio, she fell in love with it. When AMRAD’s pioneering station 1XE at Medford Hillside went on the air, Eunice became the ﬁrst woman announcer in Massachusetts. Born in 1898, before women could vote, Eunice was raised on a farm in Mattapoisett. She never planned to go into broadcasting; at one point, she thought of becoming an artist. Career options for women were few in those days, but she decided to follow her dream, attending art school in Boston. When she ran out of money, she sought work, and found that the AMRAD factory was hiring. Many of the men were off ﬁghting in World War 1, and her skills with technical drawings were welcomed; even after the war, she remained employed. AMRAD operated a radio station, 1XE (later known as WGI); it was one of the ﬁrst in the United States, and many of the AMRAD staff also worked on the air. Back then, all programs were live, and the announcers did a little of everything—they not only played phonograph records, introduced the performers, and read the news; if a guest did not show up, they were expected to entertain. Fortunately, Eunice was an experienced vocalist; in addition to announcing, her other duties included reading radio bed-time stories to the children in the audience, and if the equipment broke, she did basic repairs. And contrary to the myth that people did not like female announcers, Eunice was very popular. During her nearly ﬁve years of announcing, she received many fan letters. When AMRAD went bankrupt in 1925, Eunice returned to doing technical drawings, working for the New England Power Association, but she continued to love broadcasting, especially ham radio. Her call letters were W1MPP and along with her mentor, Irving Vermilya of WNBH in New Bedford, she participated in many conventions. 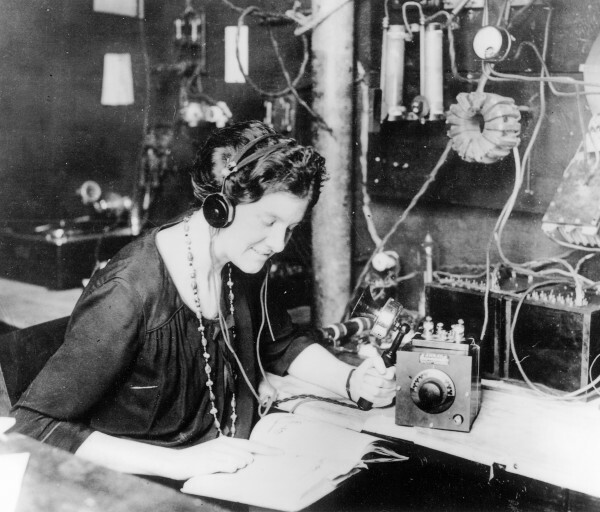 She also set up a ham radio network for blind people, and was known for mentoring young amateurs. In 1948, she married Ken Thompson, with whom she had worked at AMRAD many years earlier. Eunice died in March 1982, at the age of 84.